SURPRISE! I've actually been away from BC for almost 2 weeks now! I left on the 14th and headed to Toronto first for my wedding dress fitting, some wedding planning and a bridal shower... all while B moved into our new house. 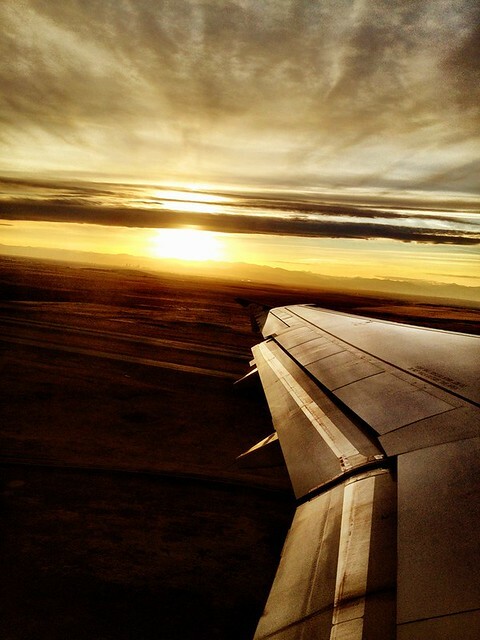 Some of you who follow me on instagram may have caught onto my travels. Then, on Thursday morning we met B at the airport and flew to Boston to spend the weekend with his family. B got to enjoy some boy time in the city for his bachelor party, while I had some girl time with B's sister and one of my friends, and yesterday I had a surprise shower. What a crazy and fun two weeks! I loved every second of it, so I will have two showers to share with you, as well as some house posts soon! We'll be back at our new house this afternoon and I am SO EXCITED to finally be living there. So Happy Memorial Day to all of my American readers, and Happy Monday to everyone else. I hope that all of you had a wonderful weekend wherever you are and whatever you did! There is A LOT of exciting stuff to come soon! 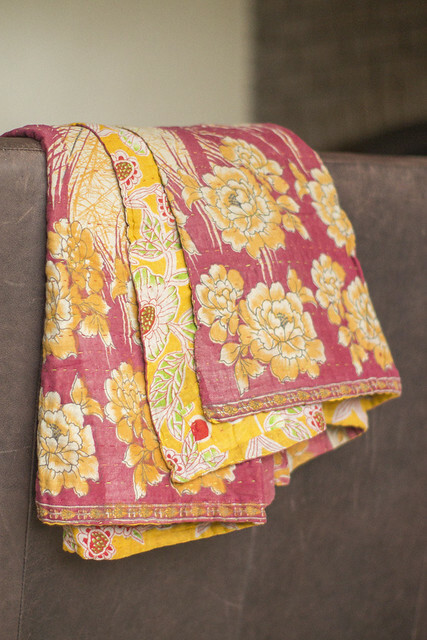 A lovely, summery kitchen from Decor de Provence. 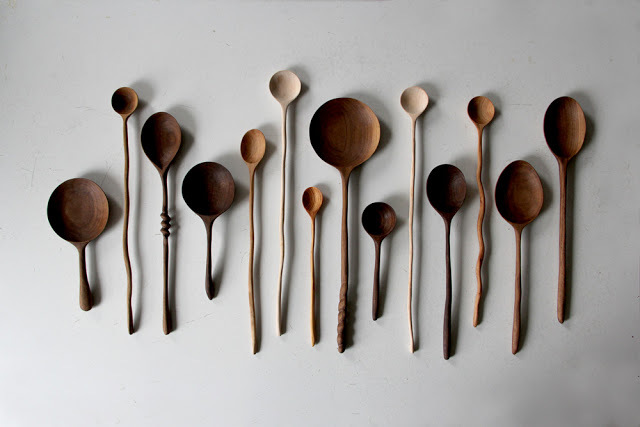 Ariele, from brooklyn to west, has been carving some seriously pretty spoons! Needless to say, I was pretty excited that she is doing a giveaway to win one of her gorgeous hand carved spoons! If you haven't entered yet, head on over now! 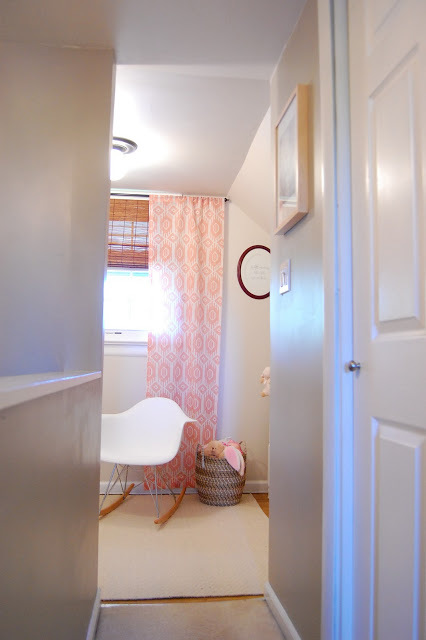 I love how Elizabeth decided to spruce up some plain white curtain panels with ribbon! Simple, yet extremely effective. 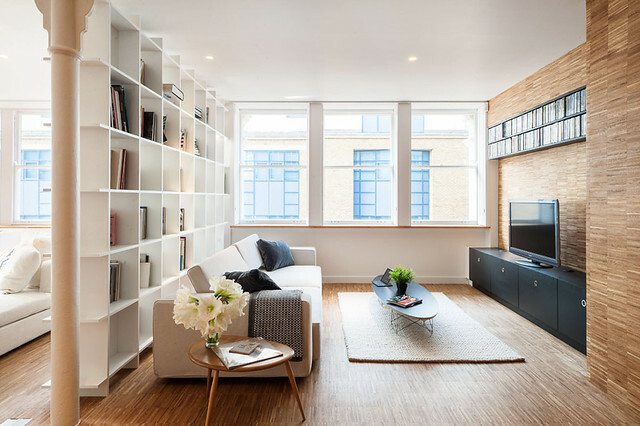 A lovely loft space from desire to inspire on Tuesday. A bit more modern than I am usually drawn too, but that doesn't make me love it any less. Those light floors and walls, and the huge windows have me head over heels! See more of it here. I am madly in love with this gorgeous vacation home, found on House of Turquoise this past week. I'm ready to start packing my bags for Spain (okay, maybe not... I'm still UNPACKING an entire house... I'm SICK of packing/unpacking). So, we have a VERY busy and VERY fun weekend ahead... but I'm not ready to give it all away, so come back next week. Lot's happening around here already! What do you have planned for this lovely May weekend? 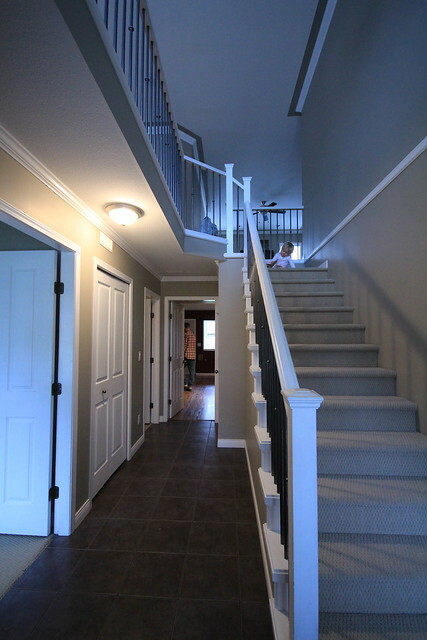 I really love how grand our front entrance feels with the high ceilings and the beautiful staircase. For now, the only things we have discussed changing here, are the light fixtures. 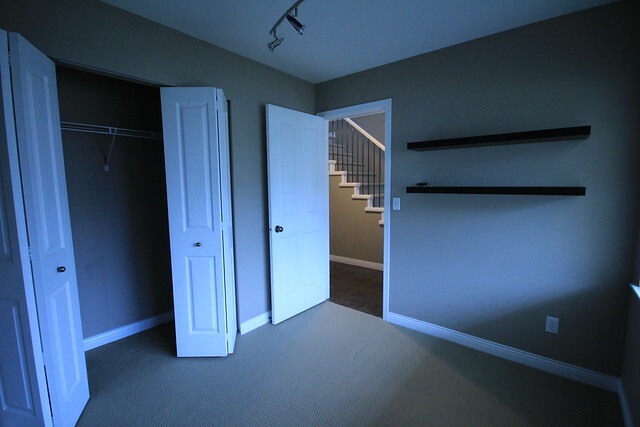 This room is considered one of the five bedrooms in the house. 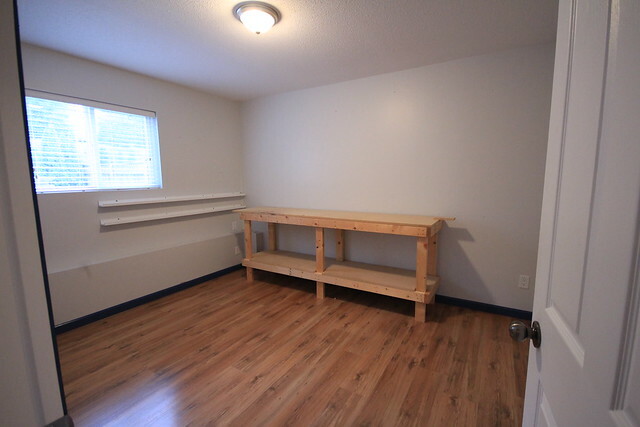 To me, the location is not right at all for a bedroom, so instead we will use it as an office space. I look forward to focusing more on my blog and Halle Handmade in this space. 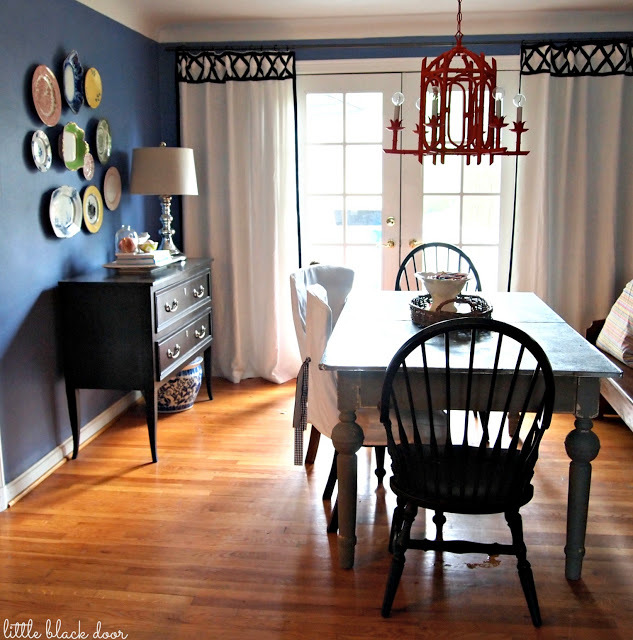 I have already started to think about paint colours, decor and of course a new light fixture. A small and rather boring space. We do have a brand new washer and dryer in here, which for now is all of the "updates" we will be doing. 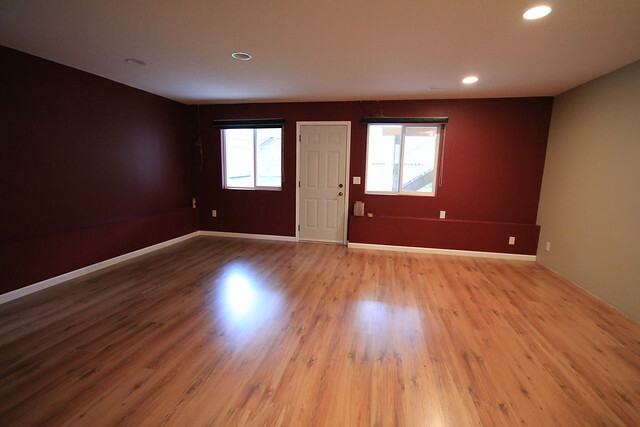 In the future, I'd like to paint, lay tile, update the light fixture and really just make this space a lot more fun and functional. This space will be used as an entertainment room. B would like a TV down here, and some of Halle's toys will probably make their way into this large room as well. It will be a great space for us to hang as a family, or with friends. What you see is what you get. It's nice and clean and at least there is tile on the floor. Glossy black may not be our thing, but it doesn't need to be touched right off the bat. 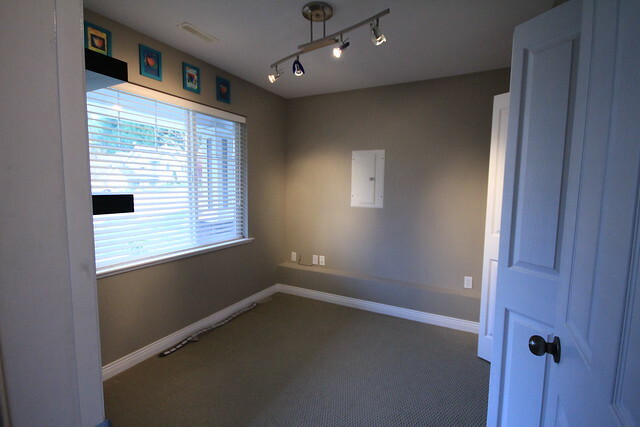 This space was obviously used as a work room by the previous owner. With a guest room upstairs for the moment, we can leave this space mostly untouched for now, but in the future the blue trim will go and we will add some other updates. It's just nice that we do have another bedroom in the basement if we ever need it. This is a space we are both pretty excited about. 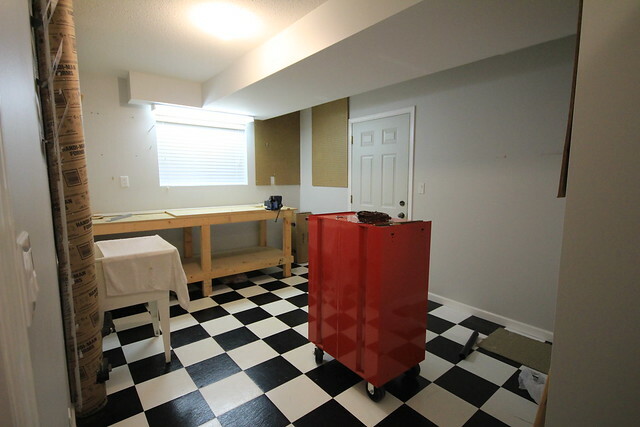 It's a great space for us to work on projects, without taking up too much space in the garage. Even better, is the door you see in the photo actually goes into the garage, giving us easy access to tools or other items we may need. I'm looking forward to having a space like this INSIDE the house! 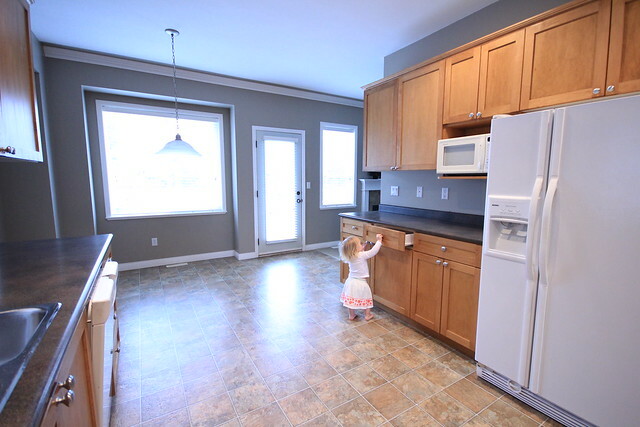 I love that this is a bright and open space, but I'm not crazy about the light fixture, and we're actually not completely sold on this space being the dining room. I find it a little awkward that when you come up the stairs the table would be right there, but we'll see how I feel once we live here for a little while. This space is smaller than it looks, but we'll make it work. 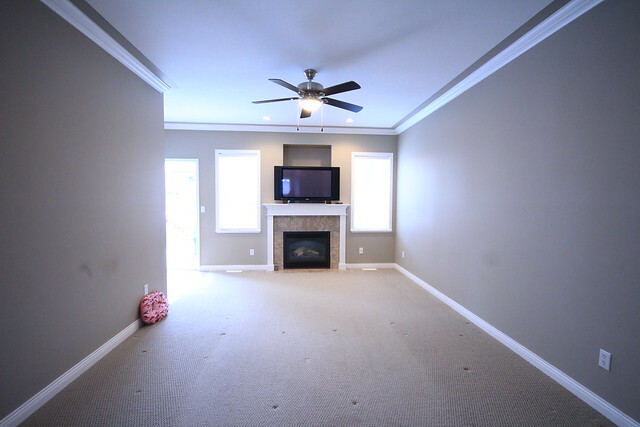 For now we may not put anything here (lack of furniture), but I would like to fill in that box over the fireplace (no tube TV will fit in there for us), and down the line we'd like to do the whole top floor with some engineered hardwood, but this room definitely has a ton of potential to be great. 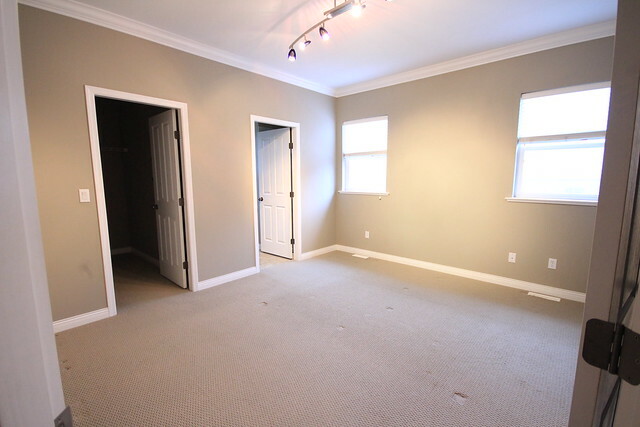 From the moment we first walked into this house, we loved that buying it wouldn't mean a huge downgrade in the master bedroom department. The space is nice and big (lots of room for our King Size bed), and the closet is even larger than our previous closet in the rental. 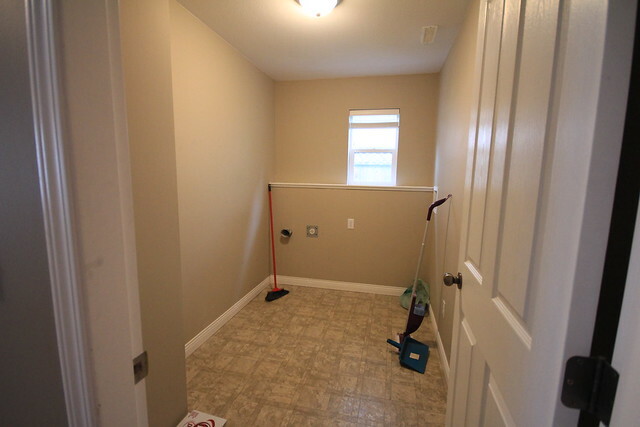 There is a lot of room for improvement here, including storage in the closet, and the master bath could use some upgrades like a second sink and some tile, but first on our list will be that light fixture in the bedroom. 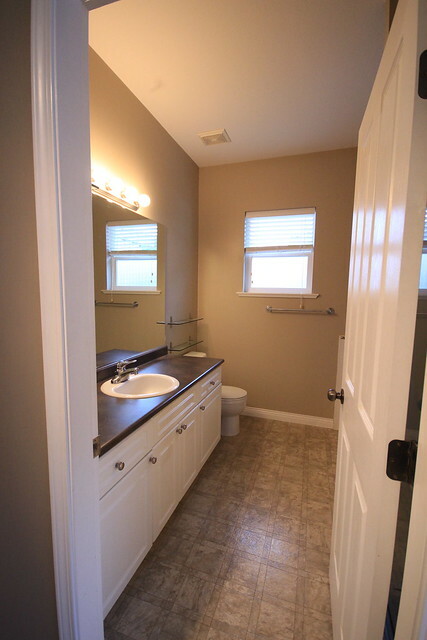 A nice and simple bathroom for Halle and guests. I'm glad that it's neutral for now (and nice and clean). 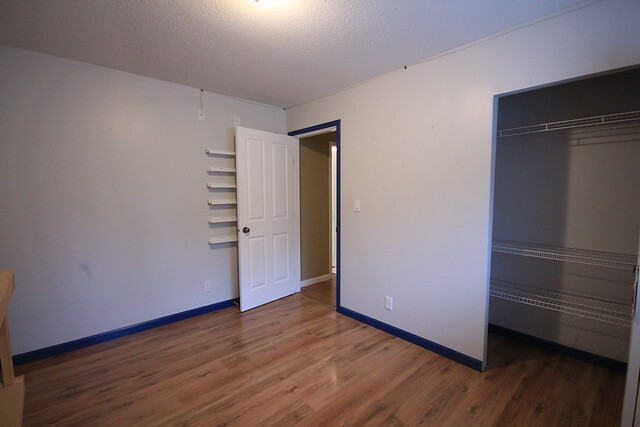 We have discussed how this room may be the first reno we do (not right away of course). 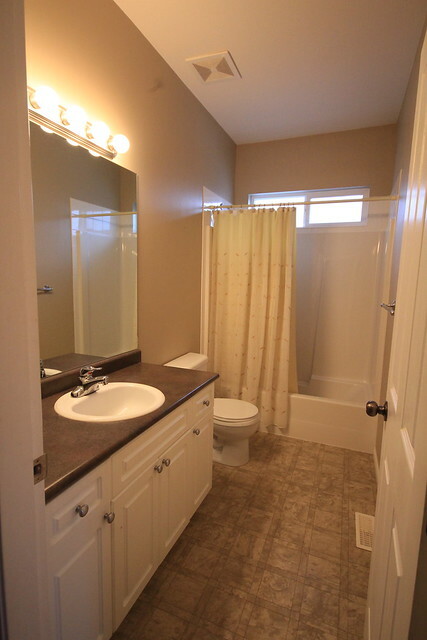 We'd like to lay new floor tile, upgrade the lighting, paint and maybe even tile in the shower enclosure. 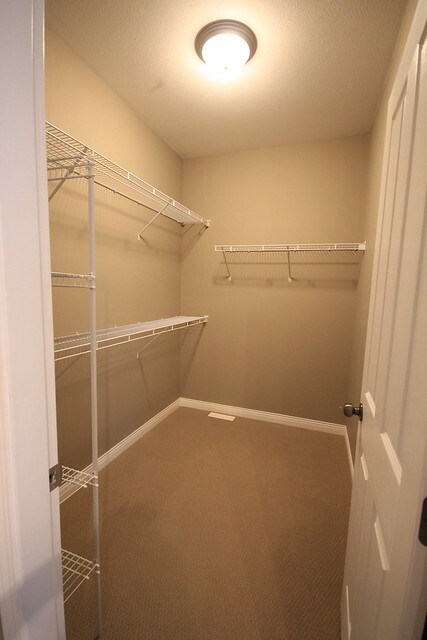 It's not a bad space, but it could definitely use some upgrades. Where to start? 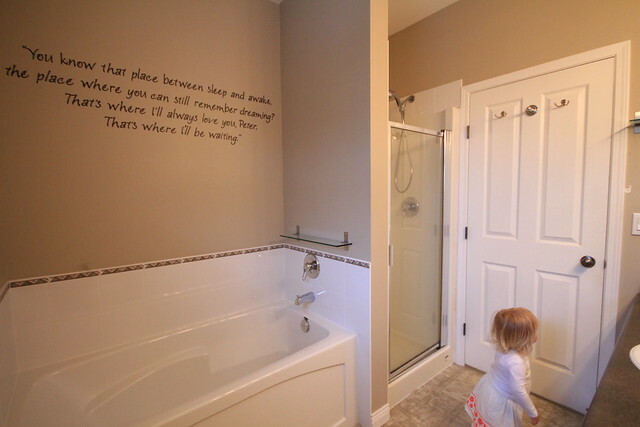 Pink walls and decals - GONE! I've already shared our inspiration for her new room, and you better believe that progress is well underway! Keep an eye out next week for some updates on how her new room is coming along! 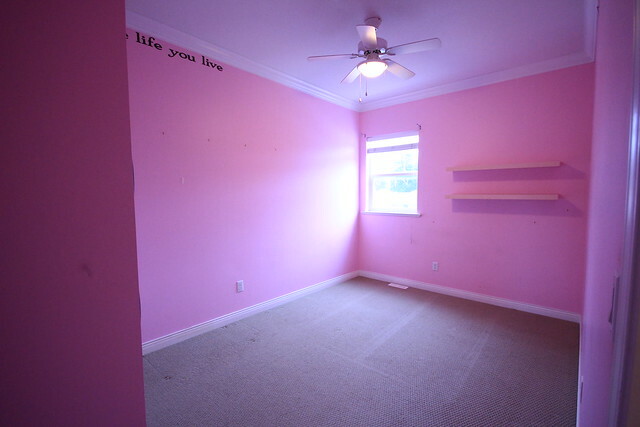 Thankfully, the previous family did not have two girls who wanted pink bedrooms. 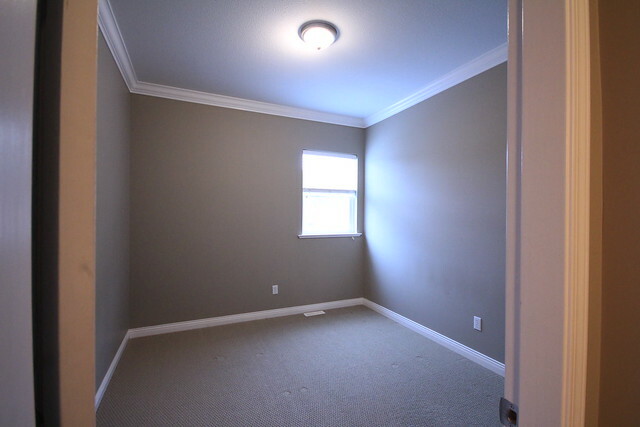 We are so happy with this nice neural grey room that will make a perfect guest room. For now, we don't need to do much except move in the furniture. So - there you have it. Your first look at our new place, as a whole. I've left out outdoor photos for now and will save those for another day. 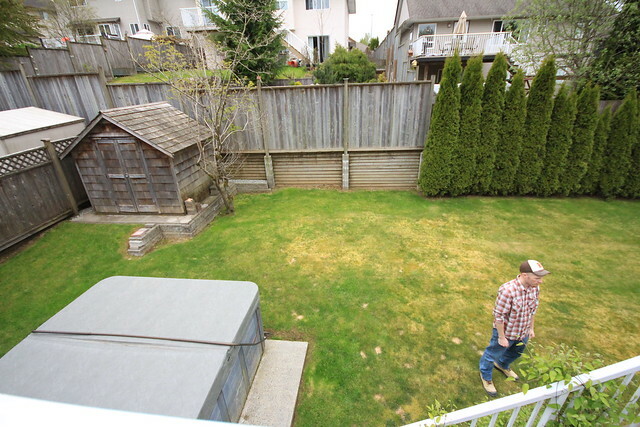 I'm so happy that the previous owners did a great job of maintaining the property so we have a nice outdoor space to start with and can only continue to improve it from here. I am beyond thrilled to be in our beautiful new home, and my mind is already swimming with all of the fantastic things we can do to this space! I hope you are as excited as I am to follow along with us turning this house into our very first West Coast home! Dad's - they're pretty great, aren't they? I feel pretty lucky that I not only have a great Father, but a wonderful Father-in-law, and B who is the most incredible Dad to our little girl. Just like every Dad, they each do so much and I have already started to think of how to show each of them our appreciation, and I wanted to share some ideas with you! My favourite part about celebrating Dad's, is making them something personal. Last year B got a little album from Halle, that included a bunch of photos of the two of them and reasons why she loves him. 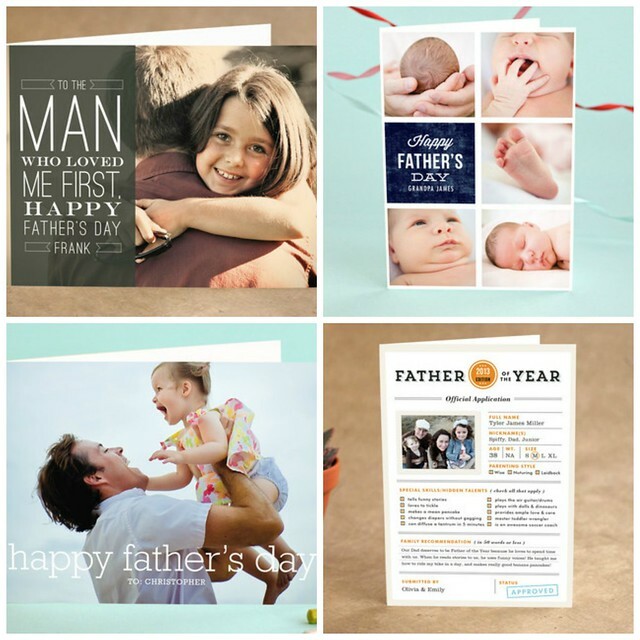 So, when I got an email from Minted, asking me to share some of their wonderful Father's Day gift ideas, I jumped at the chance. Minted has tons of great options to gift your Dad this year, including Greeting Cards, Art Prints, Personalized Stationery, Journals and more. The best part is that you can personalize each and every one of them! The lovely people at Minted were kind enough to let me create two of my own personal cards, and mailed them to me free of charge. I was very impressed with the quality of the cards. The paper used was the perfect weight, and the pictures printed so nicely. I really loved being able to make something a little special, and the whole process is really quick and easy! Looking for more than just a card? 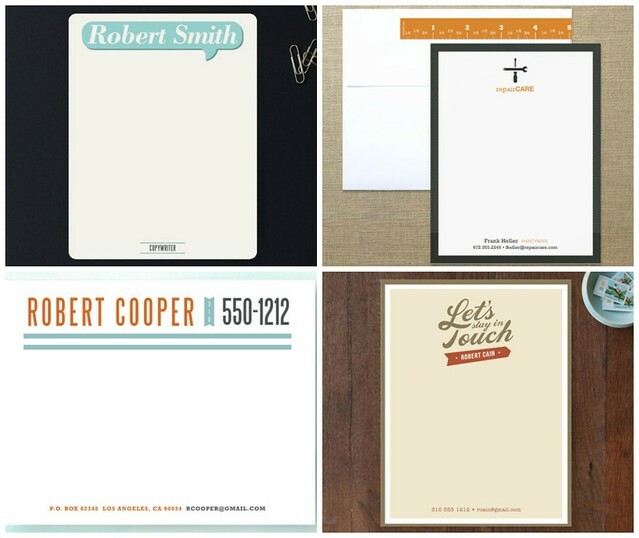 If Dad runs his own business, how about some personalized stationery, or some brand new business cards? The stationery in the top right definitely makes me think of my own Dad! 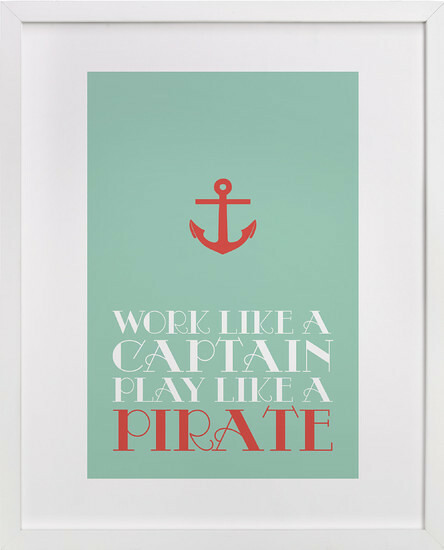 Or maybe Dad would just appreciate one of their lovely Art Prints? 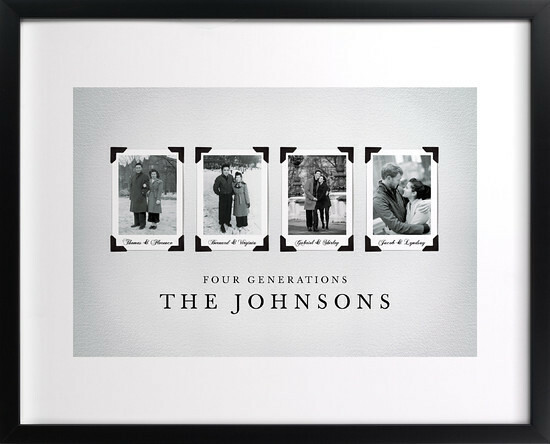 They have an excellent selection to choose from, with something for every type of Dad! What I love most about these fantastic Art Prints, is that for many of them you can choose the colours and size that you want, and you can also choose to have the frame included. So make sure that you don't forget about Dad this year! Do something special to remind him just how great you think he is! To make it even easier for you to make Father's Day more personal this year, First Time Fancy readers are going to get 15% off on all of your Father's Day gifts when you use the code FTFDAD15. The code is good June 4th, so make sure to order fast! Happy Shopping! *While I did receive two cards in return for featuring these items from Minted, all opinions expressed are my own. I would never share products that I didn't really love. This post also contains affiliate links. 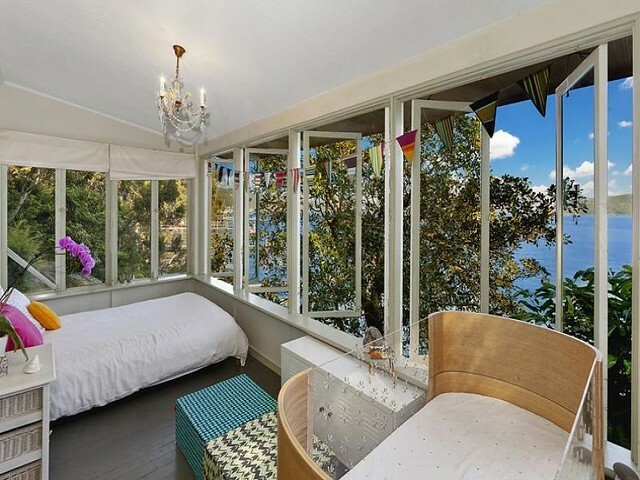 I'd love to be waking up to this view, in this little place near Sydney, that I found on desire to inspire late last week. 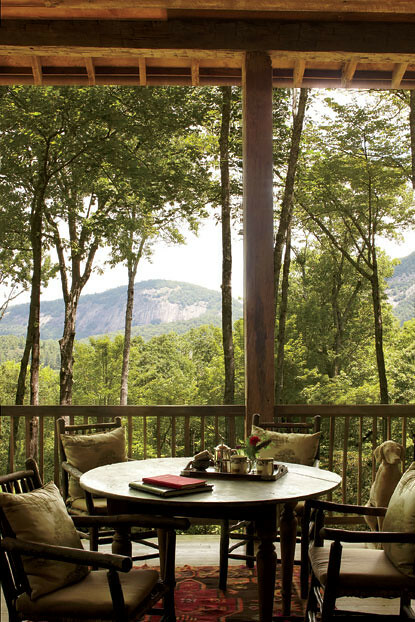 I would also be happy to escape to this North Carolina Mountain retreat, designed by Kathleen Rivers, that Meg shared last week. Before I sign off for the long weekend, I also wanted to let you know about a little fundraiser I'm having over on Halle Handmade. 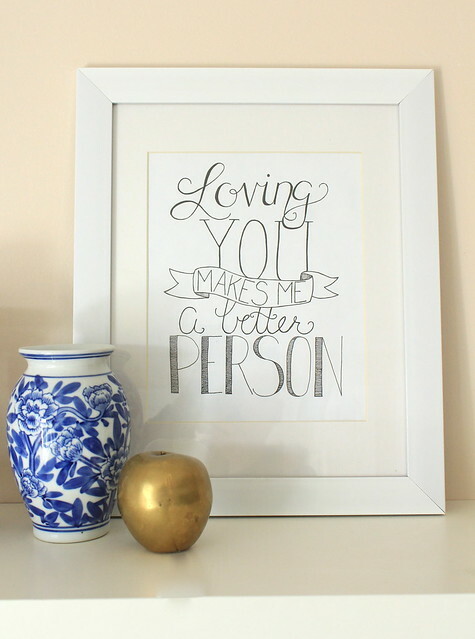 I have temporarily marked down my "Loving You Makes Me a Better Person" print, from $10 to $8. Until the end of May, $5 from every sale will go towards the "Galvis Fund". This is a fund that has been set up to help the parent's of one of B's friends, who were injured in the Marathon Monday bombings in Boston. 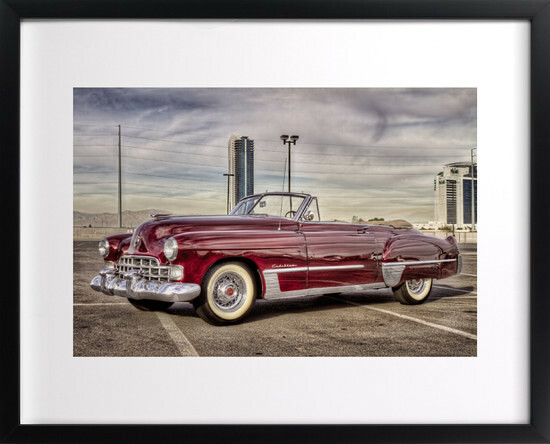 If you were thinking of purchasing this print, now is definitely the time to do it! It's no surprise that much of my list relates to escaping and relaxing. Between the move and wedding planning (which I feel like I am falling behind on), I'm feeling a little stressed. At this point, I just can't wait to be settled into the house so I can focus on the wedding. With that said, you know what I'll be up to this weekend. What do you have planned for this long weekend (Canadian readers), or just this May weekend for those of you not in the "Great White North"? ... for organization. Last week when I announced our big news, I mentioned how we never got as organized around here as I would like. Well, I have decided that in the new house I will not let things get out of hand and I will do a better job on staying on top of organization. It's so important for everything to have it's own place, and it's extremely obvious to me now with a little one running around and all of the other things we have going on. Top of my list when it comes to organization is a great filing system, but sadly B and I have not yet mastered it. 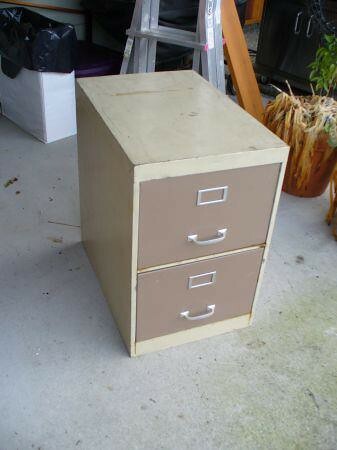 We are working on it though and are starting by upgrading our system from a plastic rolling filing cabinet, a basket of papers and a bunch of other papers piled on top of my printer and on the kitchen island, to a proper filing cabinet. As many other projects seem to be going lately, this bad boy spent over a month hanging out in our Dining Room before we finally made a trip to Home Depot for some spray paint primer. Before we sprayed it, B did some light sanding on the rusty spots on the cabinet and then I got to spraying. We let the primer dry for quite a while (like two weeks - oops), before we took a trip back to Home Depot and grabbed two cans of Rustoleum Rust Spray paint in white. 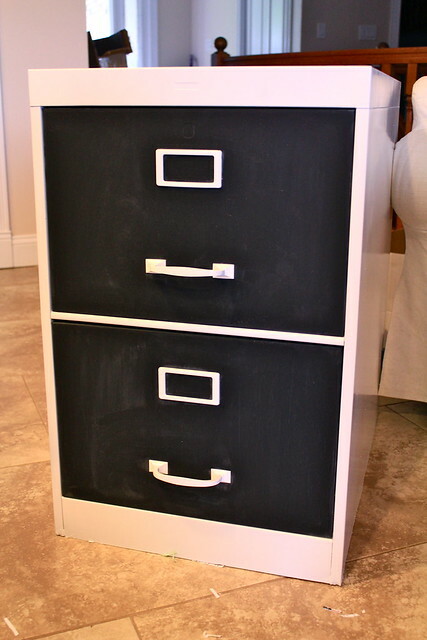 The body of the cabinet and the hardware got the white treatment, while the drawers got some chalkboard paint. With some help and encouragement from B we managed to finish this project up last week, and our old free filing cabinet is now looking a lot more pretty. I wish I could get a better picture of it, but the house is in a constant state of madness as we pack everything up, and of course the cloudy days have returned, which doesn't allow for the best photos. The cabinet itself is looking lovely though. We'll be able to write whatever we wish on those pretty drawers, or I can just leave them nice and clean - whatever I choose. Now of course the next big step will be taking care of the actual filing of paperwork. We started going through some stuff this past weekend - shredding stuff we no longer needed and reorganizing some pre existing folders. We still have a long way to go before we have a really functional and easy to use system though. How do you file everything? Do you have your stuff filed alphabetically, or do you file things in categories? 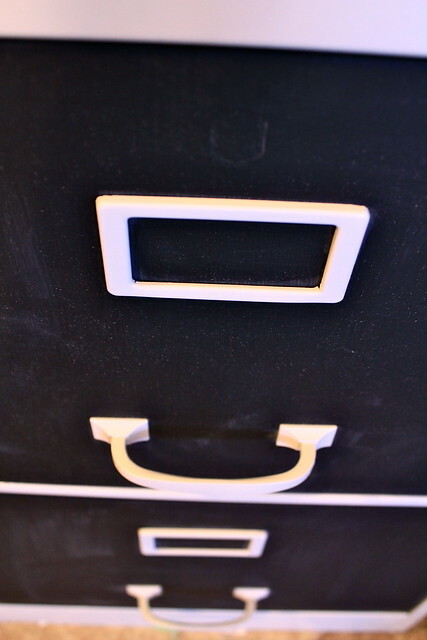 What tips do you have for creating a fantastic filing system? I'd love to hear what you do to keep your paperwork organized at home! Another weekend is behind us and we are that much closer to moving into our new place. While I run around today taking care of some last minute stuff, I wanted to share with you a little more about our decision to buy vs continuing to rent, and also a little more about the whole process. Why buy now, instead of continuing to rent? Well, we definitely considered renting. We even looked at a few places, but we always seemed to run into an issue. With our budget, it was hard to find a decent place in our desired location that would allow us to have the dogs with us. Obviously that left us in a tough spot. Some of the few places that would allow dogs were basement apartments, which are not suitable for us because of the small size of basements and of course, a lack of backyard for Halle and the dogs to play in. 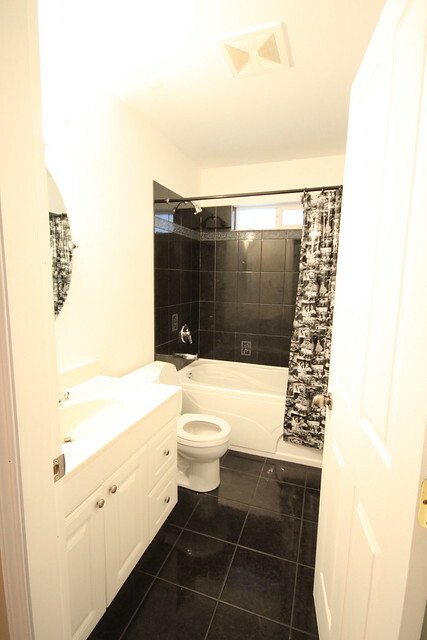 So, when finding a good rental was starting to appear hopeless, I hopped onto MLS just to take a look at what was available in the surrounding areas. We had a few options open to us to finance the purchase of the new place, so it just seemed like there was potential to go down this route. We found a fixer upper that was super cheap and contacted the listing agent to inquire about it. Of course, it turned out to not be the right house for us, but the realtor WAS. In the end, we are both confident we made the right choice and we are looking forward to many firsts in our new home with our little family. How did you find the buying process compared to Toronto? Crazy, or much more realistic? The process itself, wasn't all that different than what we experienced buying our first home in Toronto . We did lose one house that had two other offers put in on it. At first that was a little hard to take, but in the end it obviously worked out for the best, since we love the home we got, much more. 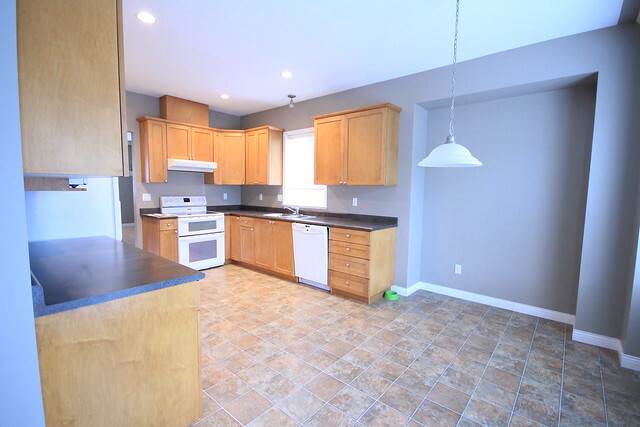 The prices and taxes are a little higher out here, BUT our new house is also twice as large as our previous place and we have lots of outdoor entertaining space. On the other hand, we found shopping much more difficult this time. The first time we bought a house we were a young couple with one dog looking for a deal, in the city, on something we could add some sweat equity to. This time, we are a young family, with two dogs looking for a liveable house that we could make some cosmetic changes to, in a family friend neighbourhood in the burbs. Our wish list for the interior was also longer. 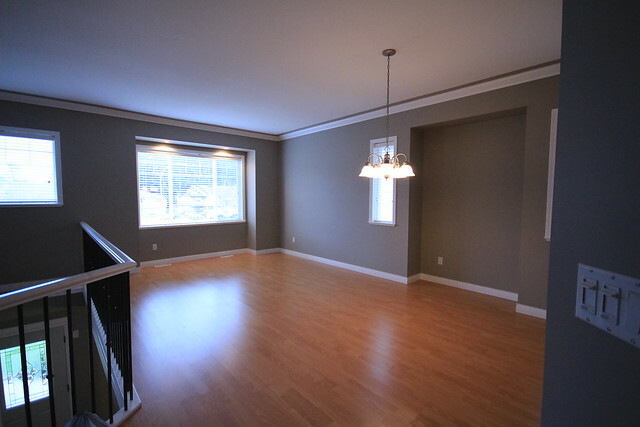 More bedrooms, more bathrooms, a good size yard, space for a play area for Halle, an attached garage etc. So of course, this hunt took a little longer, and it probably didn't help that we weren't used to the style of homes out here. The architecture is SO different from what we are used to on the East Coast. We saw A LOT of "level entry" and "split entry" homes that we weren't really digging and it made it difficult to find something in our price range that was going to work. Are you in the same area you are in now, or discovering a new area? We have picked a new area! As my previous answer explained, housing prices and property taxes are crazy high out here. If we had wanted to stay in our area, I would've had to go back to work, and neither of us saw the point of me going back to work just to pay for a higher mortgage and childcare (also incredibly expensive). We are pretty excited about living somewhere new. For the most part, we aren't that much further from the friends that we have made, and though B's work commute is longer, it could NEVER be as long as it was/could be when we lived in Toronto. Does this mean you'll be selling your house in Toronto? Nope, not even close. The house is still ours, so you can be sure that in the future you will more than likely see some more changes to that home before it does go on the market. For now though, no immediate plans of selling. Did you have to compromise on any of your wish list items? Absolutely. There was no way we were going to find our dream house on this hunt - not in our budget. The first house we put an offer on had the perfect backyard. Nice and big, with a huge deck that backed onto a green park - perfect for Halle and the dogs, but the house didn't give us a ton of room to grow in and needed more fixing up. In the end our yard is a little smaller and less private, but the inside is excellent, with a great layout and tons of space for us to grow into. I think the yard was a harder compromise for B to make, but when we went to see it for a second time last week he realized it wasn't quite as bad as he remembered. And no.... NO, we don't get to keep the hot tub. They actually even took the washer and dryer, so we have new one's on the way. We'll be busy wrapping things up over the next few days, but I do have some stuff to share with you. So check back! If you have any other questions how our new house, or our home search here on the West Coast - ask away! I want to wish a very Happy's Mother Day to all of the Mother's out there! You have the most challenging and rewarding job in the world. I of course never imagined what a roller coaster parenthood would be until we boarded the ride ourselves, and I have a new appreciation for what it means to be a Mom. So thank you Mom's everywhere, for doing what you do everyday! I ESPECIALLY want to thank my own Mom. I have NO CLUE what I would do without her. She has always been a guiding light, a pillar of strength and a friend. She is a wonderful teacher, and offers me the best advice (sometimes when I don't even ask for it). Without her, I would be lost with wedding planning (and I would not have the beautiful stationery that we ended up with!). For the past week she has been away on vacation and it was HARD not being able to call her whenever I needed to chat or vent. She's the best Mom in the whole world, so thank you Mom, for everything you do! I love you! So, it's a day devoted to us Mom's and all that we do, but I know I'm just looking forward to spending today with B and our sweet girl. 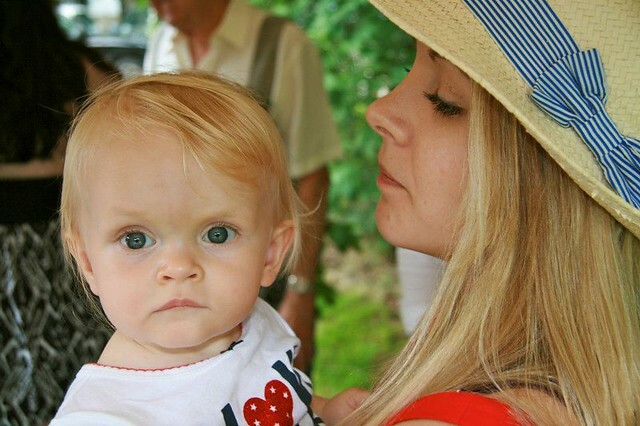 I am so lucky to be her Mama! I'm feeling pretty excited that I got back into reading blogs this past week. 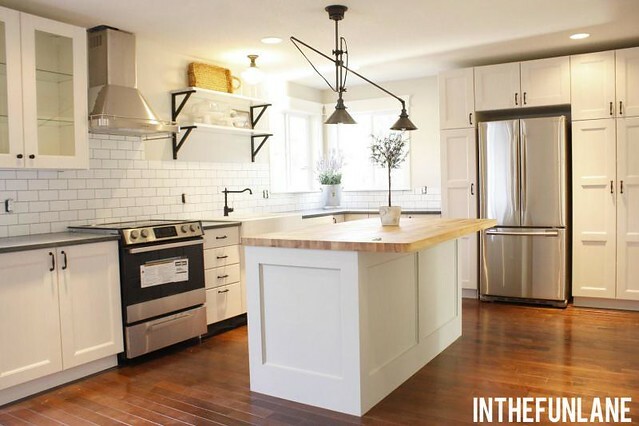 I loved seeing Holly's reveal of her latest project house over on In the Fun Lane. This place turned out so lovely, head on over to check it out! 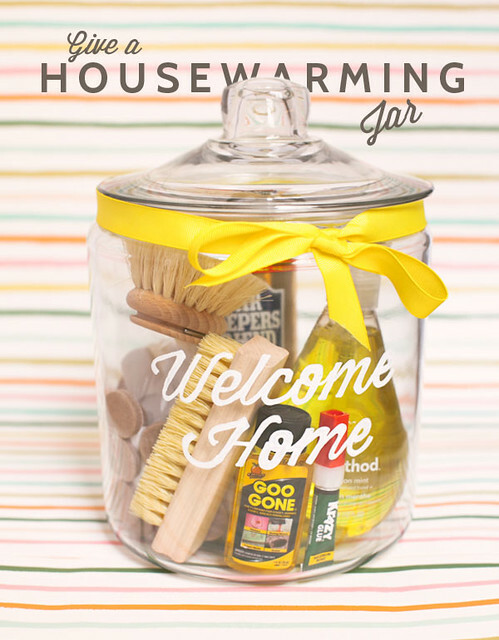 What a great idea this Housewarming Jar is, from Oh Happy Day! I swear... I'm not dropping any hints! Another benefit of getting caught up on blog reading!? Seeing what my Father has been up to back in Toronto! 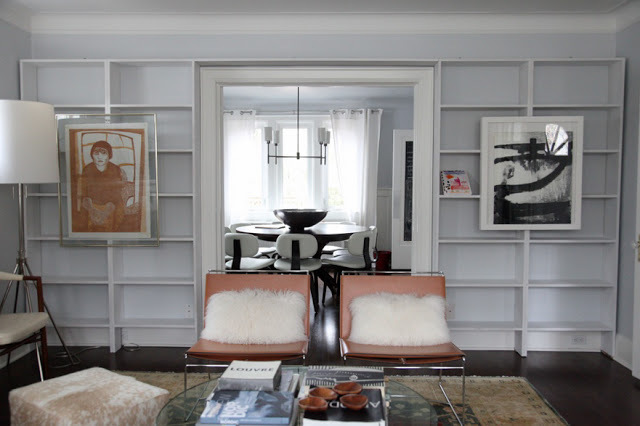 I loved seeing these shelves he built for Shannon over at 8 foot Six. I'm glad she's keeping him busy since we left! 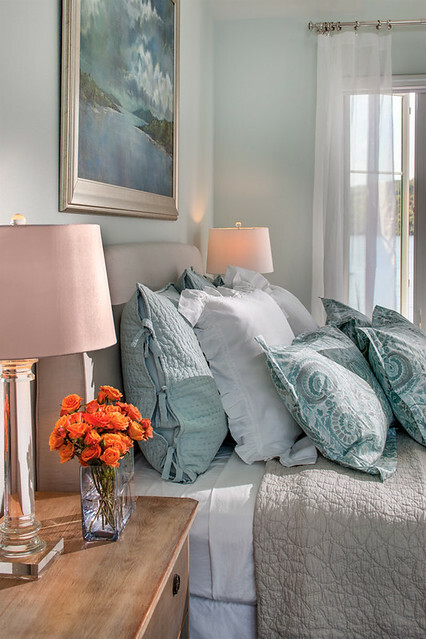 I instantly fell head over heels when I spotted this lake home on House of Turquoise this week. 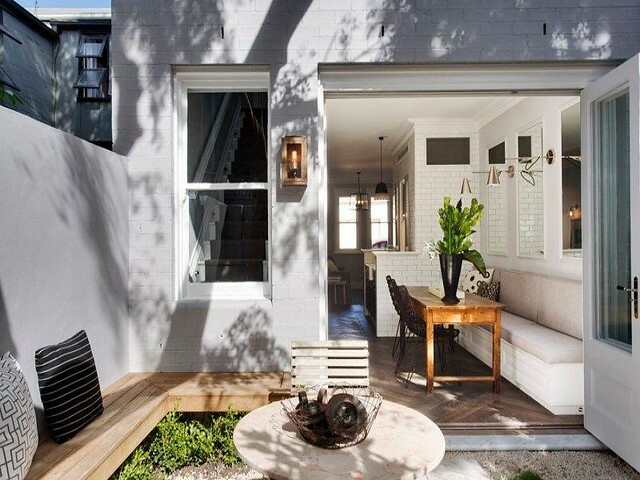 Just stunning, and looks so cozy and welcoming. The owner is Kim of Kim Hoegger Home. I'd say she's done an incredible job. What do you think? I only just got a look at Hilary's adorable nursery this past week (again, that's what happens when you fall soooo far behind on reading). Have you taken a look yet? If not you should! 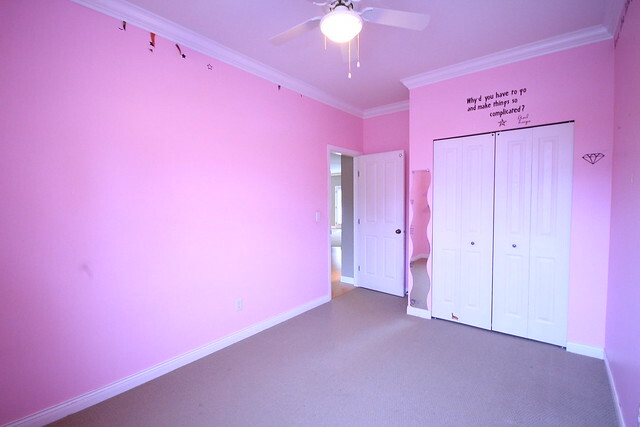 They did an incredible job transforming this tiny space into the perfect room for a tiny princess. As you can imagine, we have another busy weekend ahead preparing for the big move. Still a lot of packing, organizing and purging to do. Not to mention a few projects that we have ALMOST finished up, so we will be able to share them next week (and of course have them finished before we move houses). I also got a few questions about yesterday's announcement, so I will put together a post for early next week answering those questions for you. What are your plans for this lovely May weekend?